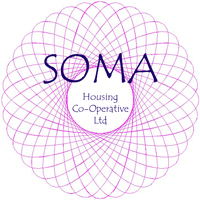 It is SOMA's intention to purchase land in order to establish a sustainable community which is made up of "social housing" with tenants living in self built eco homes which they have at an affordable rent. The co-op will also provided support structures that are required and which enable a disabled person to live independently and experience a healthier and more fulfilling life. The majority of dwellings categorised as "social housing" generally fail in this context. The result is that many disabled and disadvantaged people find themselves merely existing, because they are trapped, dependent upon state welfare or charity handouts. We intend to change this by creating opportunities for self development, the possibility to aspire to something better, the ability to see personal projects grow. We intend to do this by encouraging and facilitating people with the potential to sustain the natural environment and improve the local community for everyone. Also included on this site are a bunch of external facing links to useful information contained on other web sites. To avoid losing this web site, bookmark this page so it will be easy to find your way back again.